The U.S. Marine Corps Air Station Iwakuni is now one of the largest air bases in the Far East, much to the chagrin of residents here who have long complained about military noise. 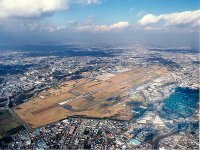 The Defense Ministry’s Chugoku-Shikoku Defense Bureau notified the Iwakuni city government 31 March 2018 about the relocation of around 60 aircraft from the U.S. 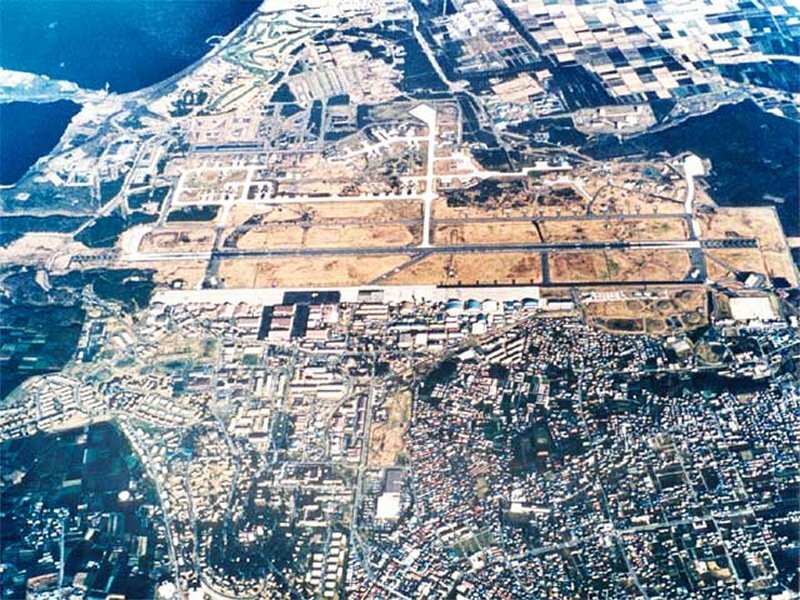 Naval Air Facility Atsugi in Kanagawa Prefecture. The U.S. military informed the ministry that the relocation of the aircraft from a U.S. Navy carrier air wing based at Atsugi was completed on 30 March 2018. That completion caps a 12-year relocation process based on a 2006 agreement between Tokyo and Washington over the U.S. military’s realignment plan in Japan. Five of the seven squadrons of the carrier air wing were relocated between August and December 2017. The remaining 24 or so aircraft began moving to Iwakuni on March 26. 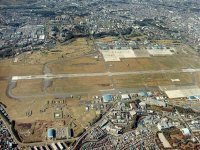 Atsugi will remain a vital base for the US military and will be used occasionally for training, refueling or maintenance. 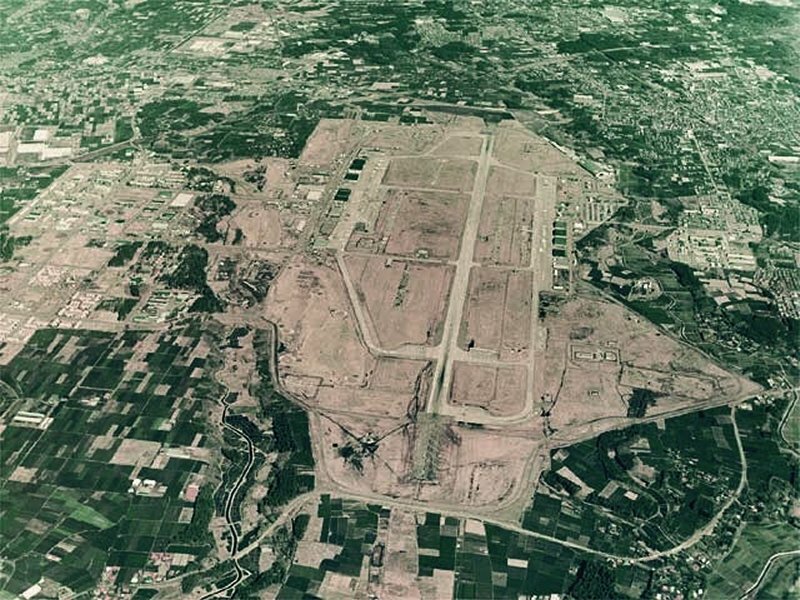 Naval Air Facility Atsugi was the largest Naval Air Facility in the Pacific and was home to Carrier Air Wing Five. 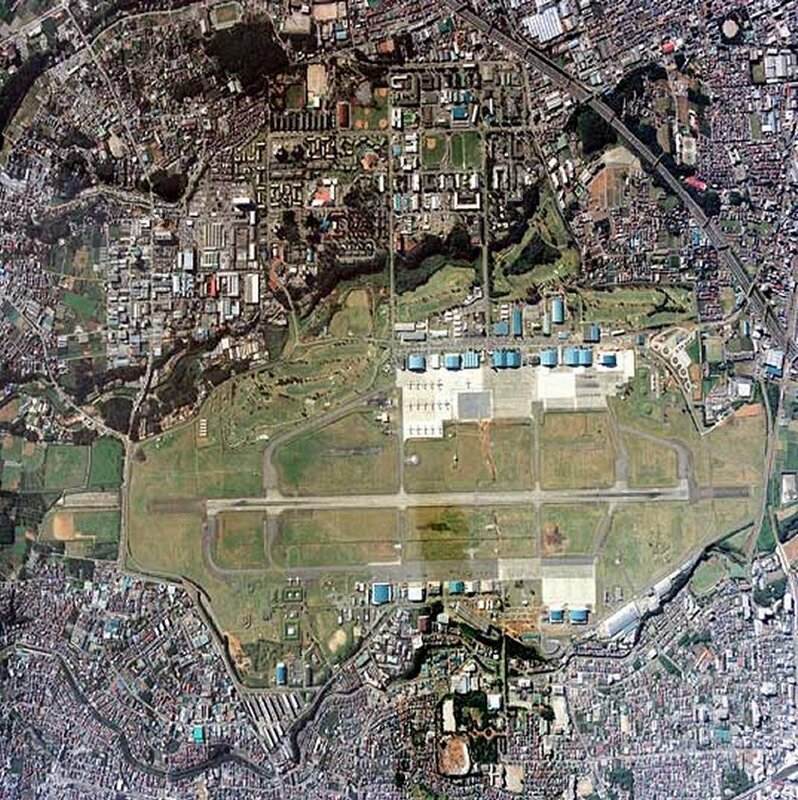 NAF Atsugi lies in the heart of the Kanto Plain on the main island of Japan, Honshu. 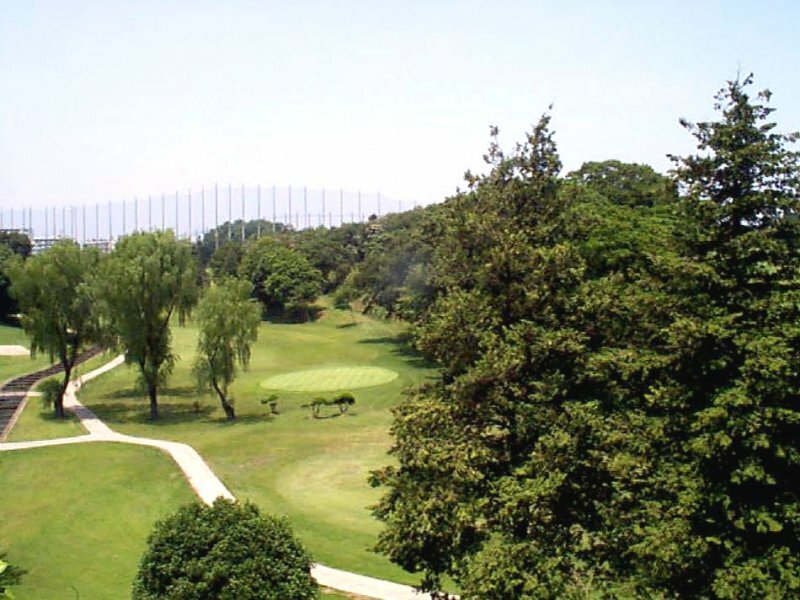 Atsugi was in an excellent location, with both military facilities and exciting Japanese locations close by offering entertainment that contribute to making a stay in Japan a wonderful experience. Naval Air Facility (NAF) Atsugi was the home of Carrier Air Wing 5 (CVW-5), the Navy s only permanently forward-deployed air wing. As such, CVW-5 was able to build a uniquely strong partnership with USS Kitty Hawk (CV 63), the carrier on which they deploy. CVW-5's planes and pilots spend a lot of their time in the air, and maintenance and support crews stay on Kitty Hawk or on the practice strip at historic Iwo Jima. Field Carrier Landing Practice (FCLP) take place at Iwo Jima. The use of Iwo Jima as a FCLP site was jointly agreed to by the Japanese and United States governments as a temporary measure until the government of Japan provides the US Navy with a permanent FCLP site. Atsugi was situated in the heart of the Kanto Plain, with easy access to metropolitan Tokyo. 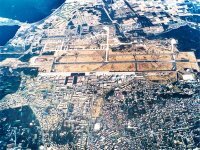 It was conveniently located within an hour of numerous other US military bases, including Camp Fuji, and Yokota Air Base, a hub for military flights throughout the Western Pacific. Atsugi houses both American and Japan Maritime Self Defense Force (JMSDF) units and has a mission to provide facilities, services, and material support for US Navy and Marine Corps aviation operations, as well as to provide logistic support for Carrier Air Wing Five. 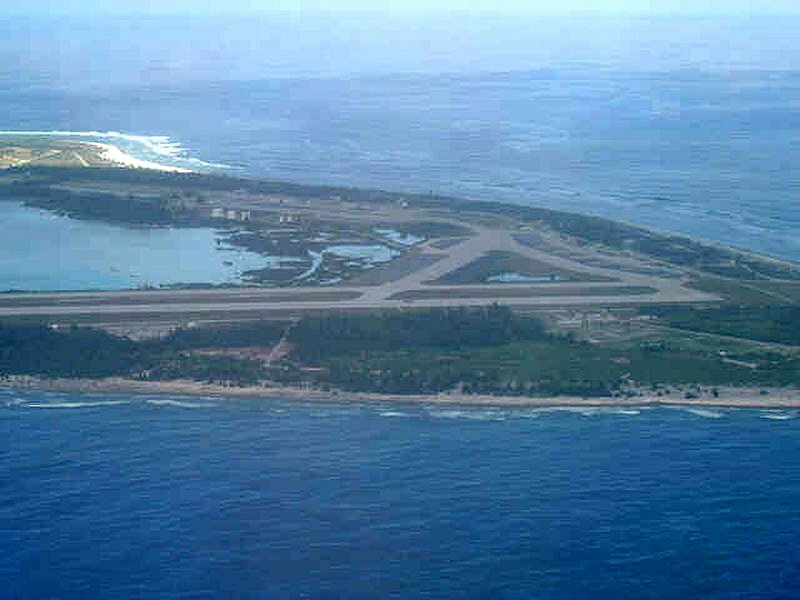 With the closing of NAS Cubi Point in the Philippines in 1991 and NAS Agana on Guam in 1995, NAF Atsugi became the primary base for support of naval aviation in the Western Pacific. 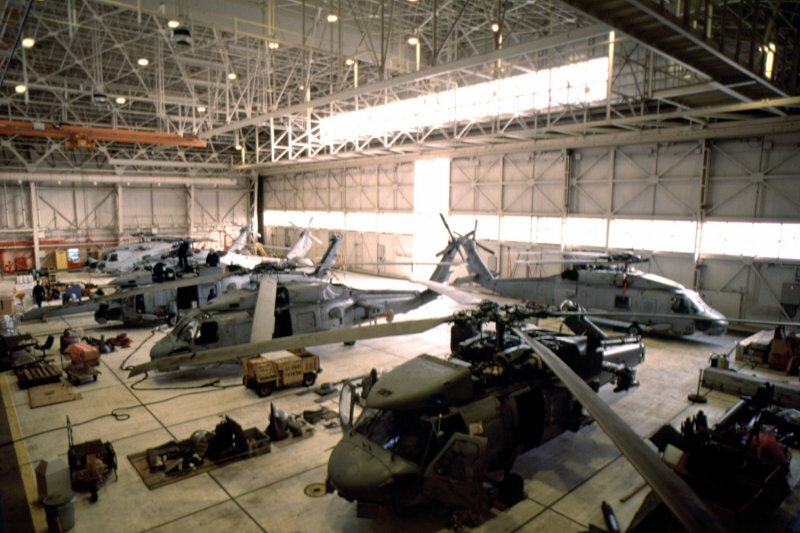 Because of the joint use arrangement between the JMSDF and American military personnel, NAF Atsugi enjoys a unique international base of operations, making it a truly interesting, rewarding place in which to work and live. 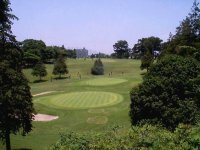 Atsugi was an accompanied tour area, with concurrent travel of dependents authorized. On-base housing was authorized for accompanied personnel at GS-12 and above. Current waiting period was 24 to 36 months. Residence in BOQ was authorized for unaccompanied personnel at GS-7 and above. The current waiting period was eight to 12 months. Off-base rentals are available within 30-60 days after application was made. In addition to a moderate climate, which can cause problems for asthma and allergy sufferers from pollen counts, the air quality at NAF Atsugi was generally poor. 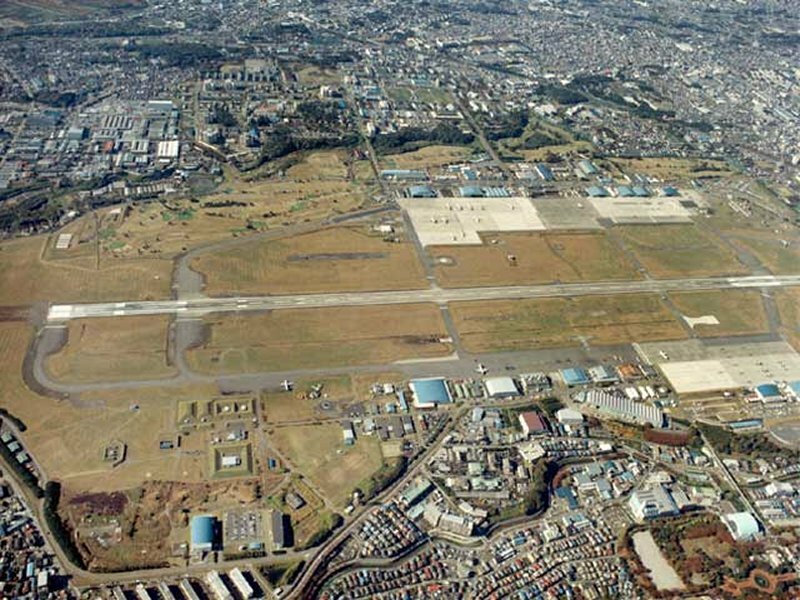 Current environmental conditions at Atsugi pose a potential health risk. As a condition of employment, the employee and dependents must undergo a medical screening at a Navy medical treatment facility in CONUS to determine suitability for assignment to Atsugi. 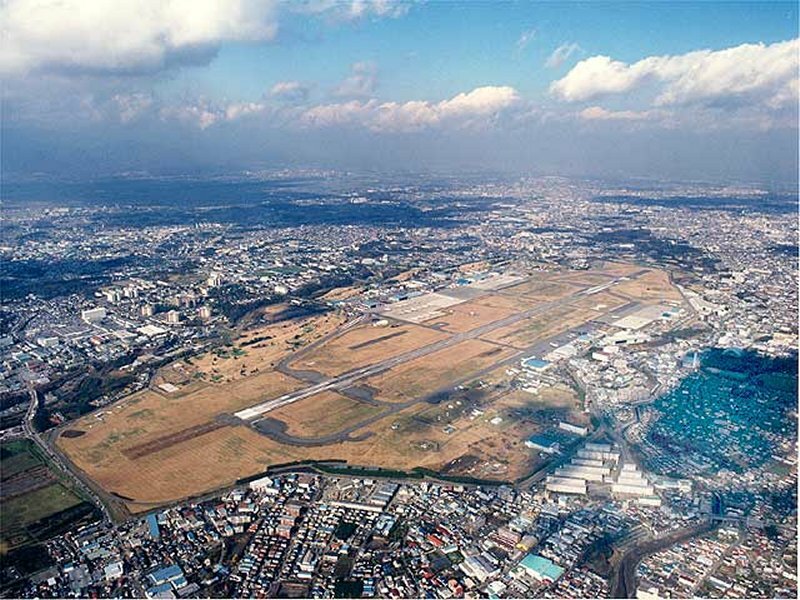 NAF Atsugi was located twenty miles from downtown Tokyo, near the cities of Yamato and Ayase City. It was a fairly compact base, and was shared by both Carrier Air Wing 5 and many units of the JSDF. The neighborhoods surrounding the base are mostly simple "bedroom towns" where people who work in the larger cities of Yokohama and Tokyo live. These nearby towns are very built-up, with houses, apartment buildings, and sushi restaurants all crowding into a very small space. The Sagamino train station was one mile from the front gate, providing thirty-minute train rides to Yokohama, and about one-hour rides to Tokyo. 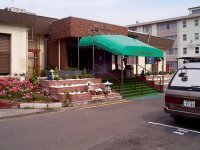 Very few naval bases have the sort of family services that Atsugi has. 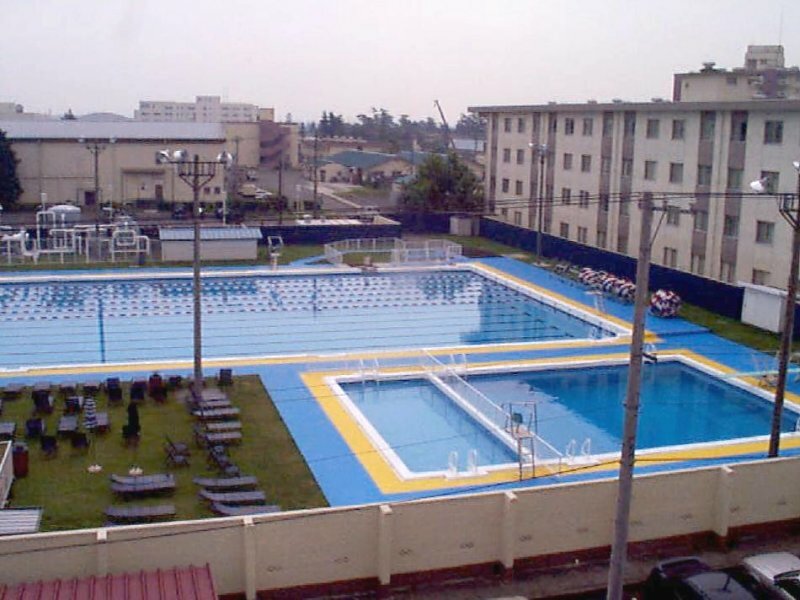 In a small area that was easily accessible on foot, one can find a well-equipped commissary, exchange, post-office, video store, movie theater, bowling alley, home improvement store, gas station, softball field, football field, track, three gyms, a swimming pool, and a multitude of restaurants, serving both Japanese and American food. Atsugi was also home to excellent Enlisted and Officer's Clubs. 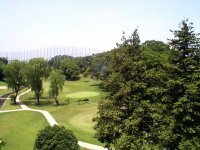 A school system was run in conjunction with Camp Zama, just five miles away, and a very well equipped Family Service Center provides relocation assistance, cultural classes, spousal employment opportunities, and dozens of other helpful services. Both the MWR and Single Sailor programs provide tremendous choices of organized tours and sightseeing trips, ranging from shopping trips in the nearby towns to week-long trips to Beijing. Almost all single personnel live on base, in either the BEQ or BOQ. 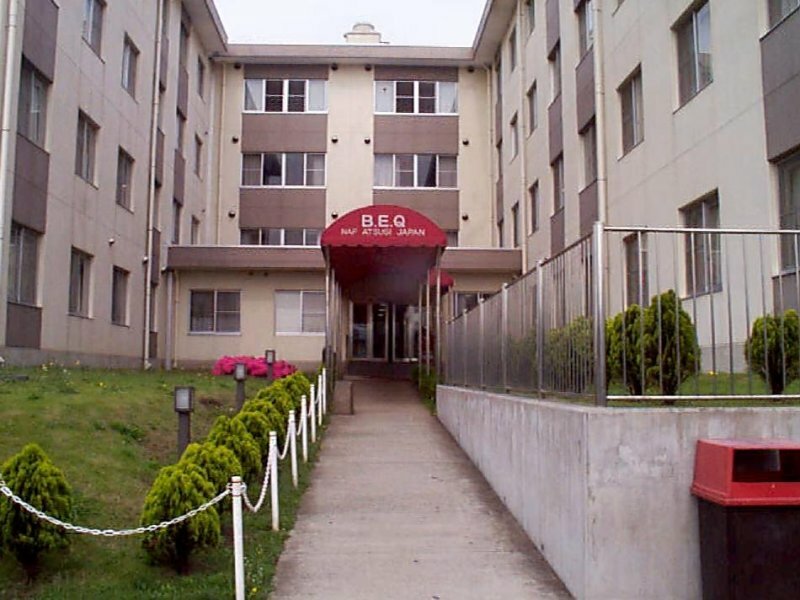 The BEQ provides nice one or two-person rooms very close to the Enlisted Club and the hangars, while the BOQ consists of 250 or 400 square foot apartments, directly across the parking lot from the Officer's Club. Many married couples live on base in one of many housing areas, while others choose to live off base in predominately Japanese neighborhoods. Almost all married couples will live off base for some time due to limitations on housing units. Both have their advantages and your sponsor or the Family Service Center can help you prepare for either. All of Carrier Air Wing 5 was located in Atsugi, making it unique for American air wings. Ten American squadrons operating eight different types of aircraft share the single runway, in addition to several squadrons of the JSDF. That makes for a crowded field, but it also allows for easy sharing of knowledge, ideas, and some excellent training. Carrier Air Wing 5 operates from the USS KITTY HAWK, conveniently stationed in Yokosuka, only fifteen miles from Atsugi. NAF Atsugi has been home to Sailors and their families for 50 years. For 28 years NAF Atsugi has also been the only Naval installation supporting an entire permanently forward deployed, co-located Air Wing, Carrier Air Wing Five. Atsugi also supports over 40 award winning tenant commands, suchas as HSL-51, NAPRA, and AIMD who not only guarantee mission accomplishment, but ensure the success of our numerous community and youth programs through teamwork and volunteerism. 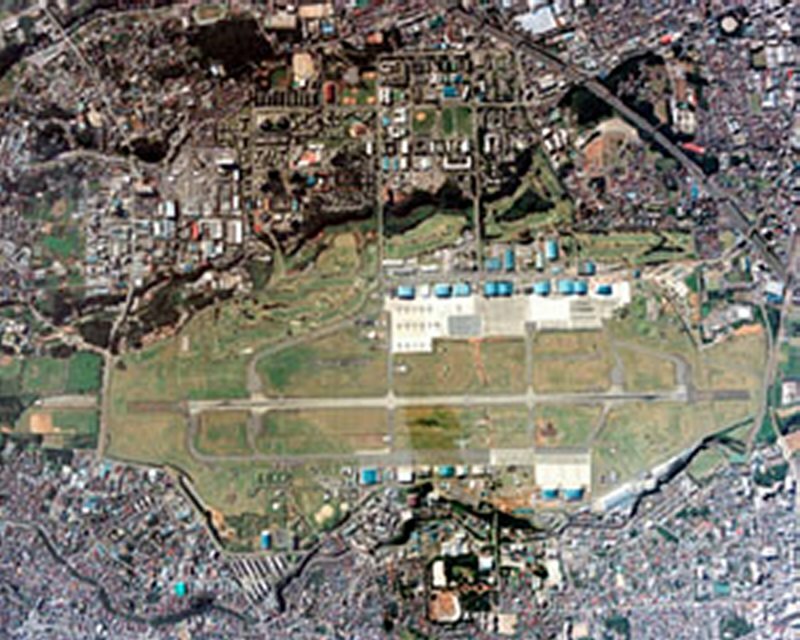 The 1,249 acres of Naval Air Facility Atsugi lies in the heart of the Kanto Plain on the main island of Japan, Honshu. The Base was originally built in 1938 by the Japanese Imperial Navy as Emperor Hirohito's Naval Air Base to address the threat posed by foreseen American bombing raids of the Japanese mainland. There were other Air Bases in Yokosuka, Kisarazu and Tateyama, however, these were regarded as being unfit for the larger planes to be used by the Japanese Navy in the future. The surrounding area was almost evenly divided into two parts - namely farmland and forest. Most of the latter consisted of pine trees and underbrush. Hardly any houses were found in this area, which gave it a very lonely appearance. For transportation facilities, there was the main line of the Odakyu Electric Railroad, Fujisawa Line and the Jinchu Line still in use today. The Base was used to train the Emperor's pilots the 302 Naval Aviation Corps, who flying their Zero and Gekko fighters, were the most formidable factor in Japan's air defense during World War II, as was the 1st and 2nd Sagamino Naval Air Group. These groups used Atsugi as a strategic airfield for night actions, and also worked to construct the base's underground defense facilities. 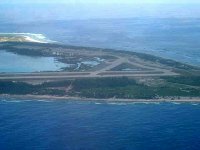 There was an urgent need for expanding the Naval Aviation Corps at the Base but the construction work was not concretely carried out owing to a budgetary deficiency in the Japanese Imperial Navy. The Base during this time handled 48 carrier fighters who flew out to ships ported at Yokosuka and 12 night fighters used to defend the skies over the Kanto Plain. To heighten the effectiveness of the 302nd against US bombers, the Group's aircraft were fitted, in addition to their standard armament, with 20mm machine cannon aimed up 30 - 40 degrees from the aircraft's centerline to permit attacks from below the bomber formations. This tactic met with mixed success. By the end of the war, the Group was credited with shooting down some 300 attacking American B-29s. The Training Facility under the command of Captain Yasuna Kozono, was the top Aviation Base in Japan and only the best pilots flew from here. But despite their efforts on August 15, 1945, Emperor Hirohito announced to the world that Japan would surrender unconditionally with the acceptance of the Potsdam Declaration. Many groups throughout the country initially refused to lay down their arms. Among these were Kozono and his pilots at Atsugi who vowed to defend mainland Japan "to the end". They revolted and printed thousands of leaflets stating that those who had agreed to surrender were guilty of treason and urged the continuation of the war. 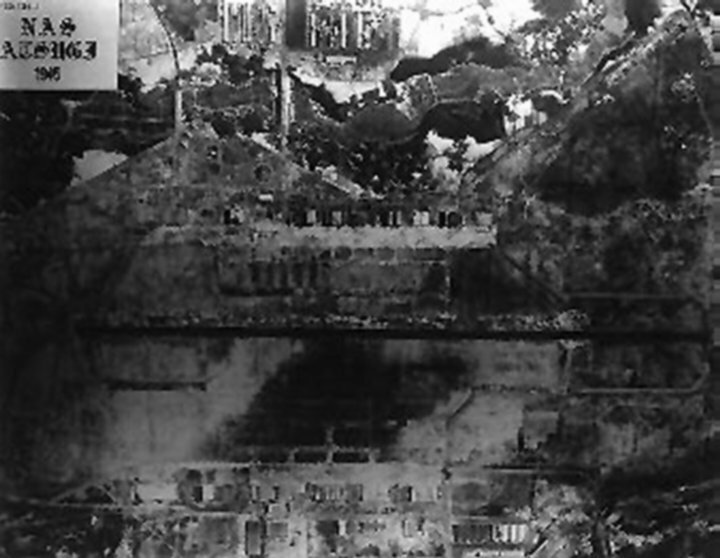 The leaflets were dropped over Tokyo, Yokohama, Yokosuka and other locations around the Kanto Plain. They also held the base captive for seven days. Realizing that surrender was a reality the pilots took off in 33 planes for their final destination and the disarmament finally began. General Douglas Mac Arthur landed at Atsugi, August 30, in his C-54, the "Bataan" to accept the formal Japanese surrender aboard the USS Missouri and assumed the duties as Military Governor of Japan. Before MacArthur arrived paratroopers of the 11th Airborne Division deplaned at Atsugi Airfield. By the end of that day more than 4,200 troops in 123 planes had completed the move from Okinawa and Iwo Jima to mainland Japan. The Prisoners of war were released from the caves and other holding facilities around the Base, the war was over. 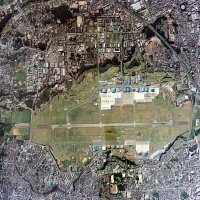 During the next five years the Base was used by the US Army as a storage area, and as an overflow camp for its Camp Zama - a former Japanese "West Point" for their Army located about five miles from Atsugi. During World War II, all buildings and facilities were in very poor conditions and very little effort was spent to maintain the buildings and grounds. 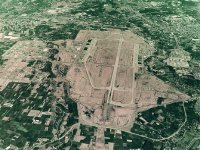 At the outbreak of the Korean War, June 25, 1950, Atsugi was selected by the Navy as its major Naval Air Station in the Far East. Naval Mobile Construction Battalion Two, Seabees arrived in October and found the Station in a complete state of disrepair. Base restoration and development began immediately. Following them was Fleet Aircraft Service Squadron Eleven who moved to Atsugi to prepare the new Station for operational readiness and formal commissioning at the earliest possible date. NAS Atsugi was commissioned, December 1, 1950 on a wet and gusty afternoon. Three Officers and fifty Enlisted men were on hand to hear Captain R.C. Sutliff, USN, read his orders as the new Commanding Officer. In January 1951, Patrol Squadron Six came as the first squadron operating from the Station. They were followed shortly by a detachment of Fleet Aircraft Service Squadron 120 based at Oppama, near Yokosuka, was ordered to Atsugi to support the VP-6 "Neptune" planes. Activity on the half of the airstrip was so intense that on one or two occasions, mid-winter-dust-storms caused by the Seabees halted air operations on the other half. Day and night, seven days a week, the giant earth movers and pavers grunted and ground while Seabees kept an anxious eye on arriving and departing aircraft. April 1951, Commander Fleet Air, Japan, RADM G.. R. Henderson, was ordered to an important command afloat and as a result moved his staff of about 15 Officers and 60 Enlisted men from his headquarters in Tokyo to Atsugi and this Station then became the Naval Air activity in the orient. On April 30, Commanding Officer Captain Sutliff assumed the additional duty of COMFAIRJAPAN. With the advent of warm weather, Medical Officers formed a sanitation detail and assigned it the important chore of keeping the rat and mosquito populations in hand. The Medical Department also waged war against the dreaded Japanese "B" Encephalitis disease. On June 11, 1951, the station newspaper - "NASAtsugi News" - was proposed and indicated the growth and development of the station. August 1951, Major construction projects neared completion including the new photo lab, control tower, parachute tower and the final inspection of a new gatehouse. In September 1951, Dial telephones were installed and a brand new 800 line dial exchange replaced an old and worn out 300 line manual switchboard. By November 1951, the first family members arrived under the new Far East entry regulations. 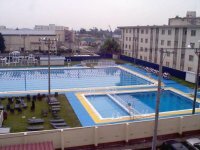 Recreational facilities were added, including a bowling center, station theater and outdoor swimming pool - all still in use today. December 1951, one year after the bases commissioning NAS celebrated with an "open house" for local Japanese guests to come aboard and share in hot-dogs and games. This was the first time Japanese were allowed to freely enter this air station. During Christmas time there was a pageant performed by Japanese children from the Elizabeth Sanders Orphanage and the base held a party for them afterwards. This tradition continues today. January 1952, more dependents arrived at Atsugi. Squadrons were reporting aboard and some were ready for rotation back to the States. April 1952, a detachment of U. S. Marine Corps took over the NAS Security Department. During the first 24 hours of duty, the Marines had 35 men on report -needless to say the Sailor's were pretty hot under the collar. March 7, 1953, An Air Force C-54 set down at Atsugi with a large group of air evacuated United Nations wounded personnel en route to the Naval Hospital at Yokosuka. This was the first time that Atsugi Naval Air Station had been the receiving point for Korean battle evacuees. During the 1950's and 60's many units flew out of Atsugi. At one point there were as many as 250 aircraft here, by comparison today, Carrier Air Wing Five, has about 80 aircraft. Following the end of the Korean War, conflicts in Indochina eventually developed into the Vietnam War. At the same time, Navy aircraft saw huge advances in design and performance, including the breaking of the sound barrier. By the late 1960's NAS was phasing down preparing to become a Naval Air Facility. In April 1969, Atsugi was involved in an international confrontation which had the entrie world on edge. An EC-121 reconnaissance plane assigned to VQ-1 at NAS Atsugi was shot down over the Sea of Japn, reportedly by two North Korean MiGs. All 31 Sailors were killed. The Base became a bustling community when, then President Richard Nixon ordered an Armada of Navy vessels to assemble in the Sea of Japan. Many Atsugi personnel worked long hours to give the 29 ships logistic support, but gradually the tense situation abated and the ships returned to normal duties. In March 1954, the MAP, Miliary Assist. Program, Agreement was signed, leading to the formation of the Japan Defense Ministry and the Japan Maritime Security Force who had operated since 1952, which became the Japan Maritime Self Defense Force (JMSDF) in July. JMSDF began receiving deliveries of SNJ and PV-2 aircraft, as well as newly-built P2B-7's stationed at Konoya Air Base in Kagoshima. Beginning in the mid-1950s, license-built versions of several aircraft began to emerge, as well as partially or wholly domestic designs such as the anti-submarine P-21, PS-1, YS-11 and KM-2. In addition, the helicopters employed by the JMSDF showed a trend toward larger and larger models. Joint efforts with the US Navy carried out in the mid-60s led to the development of still more types of new aircraft, significantly boosting JMSDF's anti-submarine capability. In 1972, it was mutually agree that the base would be shared by both nations and J MSDF moved in and became our partner in defending freedom. When the USS Midway (CV-41) was forward deployed to Yokosuka in 1972, Atsugi became a support base for her Air Wing. 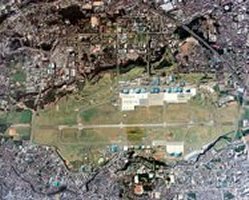 The area around Atsugi also underwent a population explosion bringing with it the encroachment we now see around the Base. In 1991, the USS Independence (CV-62) replaced the Midway. Also, in 1991, in consideration of the surrounding communities the field carrier landing practices, known in Japan as NLP's, was moved to the island of Iwo Jima, 650 miles away as an interim measure until another landing field could be situated within 100 nautical miles of the base. Carrier Air Wing Five has a long and rich heritage in Naval aviation. Originally commissioned as Carrier Air Group Five (CVG-5) in 1943, CVW-5 embarked on the USS Midway to become part of the first Carrier/Air Wing team permanently forward deployed overseas. On January 17, 1991, Operation Desert Storm began and the Midway/ CVW-5 team was America's first 911 response to Iraqi aggression against Kuwait. Six month deployments and successful combat missions continued through Operation Desert Shield and the transitioning to the USS Independence (CV-62) in 1991. In August 1999, the Air Wing again swapped to the USS Kitty Hawk (CV-63). The Kitty Hawk was a conventionally powered Aircraft Carrier which combined with CVW-5 was a constant combat ready deterrent to aggression in the Western Pacific. The current community of 8,000 personnel, US military, civilians, family members and over 1,000 Japanese National employees, continues to build upon the rich legacy while meeting increased demands. NAF Atsugi's strategic importance continues to grow, providing the finest facilities, maintenance and logistic services and support to those at the "Tip of the Sword".